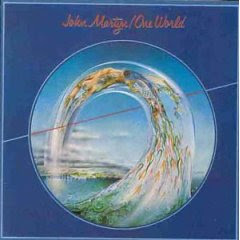 John Martyn has another album on the list after Solid Air, unfortunately this isn't as good as that one. Martyn deviates from his folksier stuff into a more poppy territory. Don't get me wrong, this is still beautiful music, few people can make music as beautiful as Martyn, but it just isn't the same thing. There is more of a world-music vibe here, this is reflected in the title of the album as well as in the music, this is no bad thing per se, but I feel like he is moving away from his bigger strengths. John Martyn is a great artist, with some very beautiful songs here, there is an ambience of late night music which is quite languid and satisfying, the title track is a good example of this, so even if this is not Solid Air it is still worth listening to if oyu liked that album. This album is one of John Martyn's more experimental works. Trippy surreal atmospheres, reggaeesque rhythms and jazzy vibes. Well known and appreciated for the interesting collaborations, including Lee Perry on "Big Muff", and Steve Winwood's keyboards especially in "Small Hours" and "Dealer". "Small Hours" was later reworked by Martyn into the track "Anna" as the haunting backdrop for Esben Storm's 1978 Australian film production of In search of Anna. This version of "Anna" also appears on Martyn's live album Live At The Bottom Line, New York, 1983.